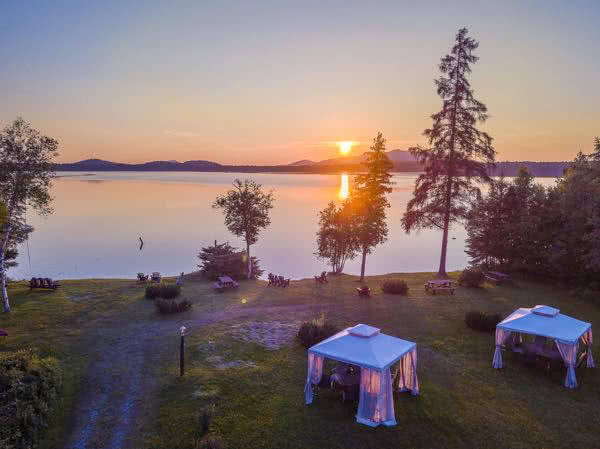 Hohmeyer's Lake Clear Lodge and our Adirondack Alps experience is literally in the epicenter of the St. Regis Wilderness region - the largest intact wilderness area east of the Mississippi - and largely undiscovered. We believe it is also the "capitol" of the Adirondacks with an unfathomable recreational, cultural, historical and environmental diversity. Out of your handcrafted lodging you are minutes away from unparalleled solitude or internationally recognized cultural and sporting events. Three Supp & Snooze Rooms: each with a different motif but all with their own private bath. Symbolizing their diverse nature they each have their own individual name: Birch, Canopy, and Pine. Five Secluded, Romantic Chalets: Each with fireplace, handcrafted living rooms and beautiful decks - miniature great camps! They are respectively named Writers, Guides, April Melody, November Moon and Sundown. Lakeside Vacation Rentals: We believe the view of the quiet lake as it faces directly west offers the most spectacular sunsets in the Adirondacks. 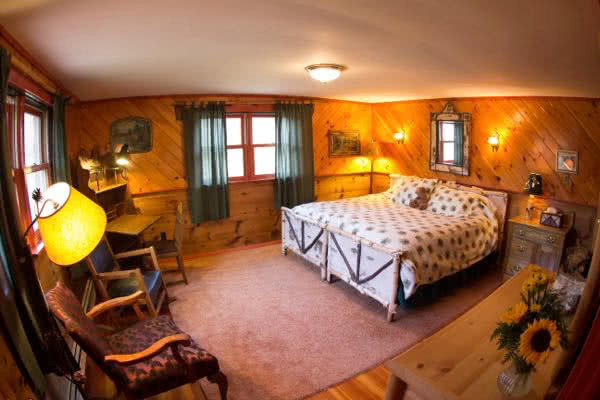 Our hand-crafted vacation rentals are called the Guesthouse where you can rent the entire house or one of two floors named Loons Watch and Woodsmoke and the Lakehouse that is uniquely designed for guests of 2-12 with individual room names such as Reflections, Great Camp and Sunset Pine. Home of the Adirondacks Alps culinary experience with hand-hued dining room that seats 65, a huge Rathskeller with immense stone fireplace that serves as a place to relax (and where Ernest explains the evenings fare), the Adirondack's only handcrafted Wine & Bier Keller with over 100 old world biers and 125 boutique wines, a game room, lobby/reception area and outdoor biergarten (weather permitting). 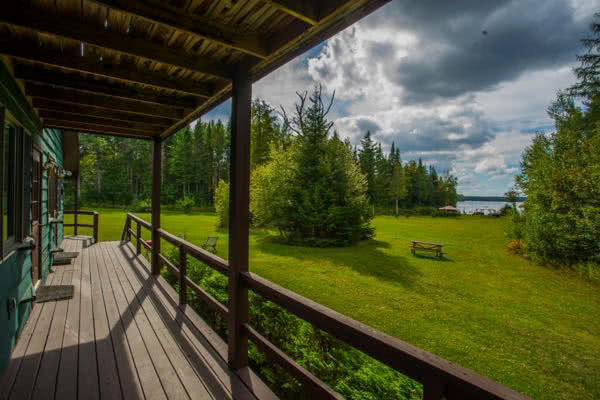 With 175 feet of beachfront with over 2 acres of lawn. This is a great area to spread out, relax and use our amenities that include canoes, kayaks and row boats (we also have bicycles). There is storage and changing room. The beach is a great starting point to travel the St. Regis Wilderness area. 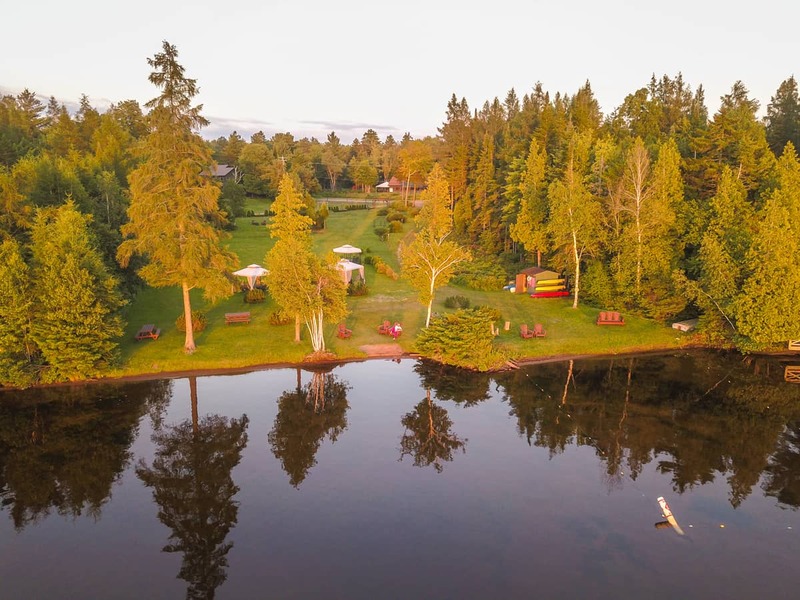 The lawns are immaculately cared for and great for solitude, outdoor games and special events such as lakeside weddings, family reunions or meetings that can be easily arranged with tents. Electrical power is available. There are no bathrooms on the lake unless you utilize one of the vacation rentals Our Lakeside has just simply the greatest sunsets you will see in the Adirondacks as our beach faces directly west and looks right at St. Regis Mountain. There are 2 huge lawns in the front of the main building great for recreational activity (there is a basketball court), events that require a tent yet access to the main building for indoor/outdoor functions and a biergarten behind the Rathskeller. There is also the Lakeside lawn. For hiking, cross-country skiing and snowmobiling can be directly accessed from our property. That serves gourmet take-out to guests as well as off and on-site catering with full liquor license. That serve as the focal point of Cathy Hohmeyer's fresh herbed, spice and vegetable based Adirondack Alps Cuisine. Directly on our 22 acres is a mile long trail that takes you throughout our woods and from which you can access the Lake Placid-Old Forge Recreational Trail and the Jack Rabbit Cross Country Ski Trail that takes you from Paul Smiths to the High Peaks. The Lodge is located on the Adirondack Trail (Rt. 30) Highway that runs north-south through the Adirondack Park and is a great scenic drive or bike. By just sitting in a chair outside your hand-crafted Lodging or down by the lake you hear, see ands sometimes smell the natural beauty that is the Adirondack Park. 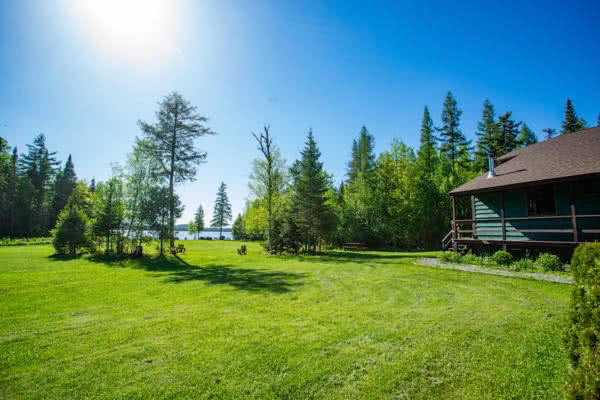 Birds, trees, flora, fauna, fish, wildlife and our resident deers, loons, ducks and bald eagle are just a sampling of what is right in front of you without going anywhere off the property. Is a unique body of water as it is the dividing line between those waters that run north and those that run east and south. The rivers that run to the North go to the St. Lawrence River that separates the United States from Canada and connects the Great Lakes to the Atlantic Ocean. The waters that run east and south flow to Lake Champlain that borders New York State with Vermont and New England and south to the Hudson River and beyond. It is 65ft. at its deepest point and is approximately 1.5 to 2 miles in circumference. It is excellent for boating, fishing (the famous lure "the Lake Clear Wobbler is named from it), wind surfing, birding, swimming, cross-country skiing, snowmobiling and contemplation. The 58 bodies of water of the St. Regis Canoe Area form the headwaters of three rivers: the Middle Branch and West Branch of the St. Regis River, and the Saranac River. It is an area where one can escape civilization and find an Adirondacks not much different than before human incursions. With such a vast array of ponds, lakes, rivers and streams, the St. Regis Canoe Area offers some of the best 4-season recreation in New York State. In the summer enjoy exclusive non-motorized boating and in the winter, miles of back country hiking, cross-country skiing and snowmobiling.